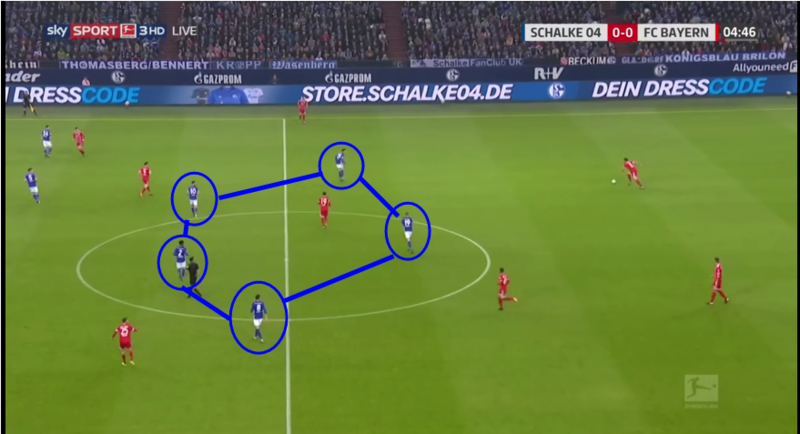 Schalke lined up in their 3-4-2-1 formation that had seen them take 9 points from a possible 12 before the game against Bayern, with a few changes made to counter specific threats from Bayern. Benjamin Stambouli was dropped for fellow ex-Tottenham player Nabil Bentaleb whilst Leon Goretzka was moved further up the pitch to support Guido Burgstaller with the young American Weston McKennie making his first start alongside Bentaleb in the heart of the Schalke midfield. There was another player making their first Bundesliga start, in the form of James Rodriguez who started on the right hand side of Bayern Munich’s attack. With the news that Manuel Neuer is out injured until January there was also a rare start for backup goalkeeper Sven Ulreich. With David Alaba still out injured, it meant Rafinha maintained his place at left-back. Other than that there were no real surprises for Bayern, as they lined up in their usual 4-2-3-1 system, with Thomas Muller playing behind Robert Lewandowski. 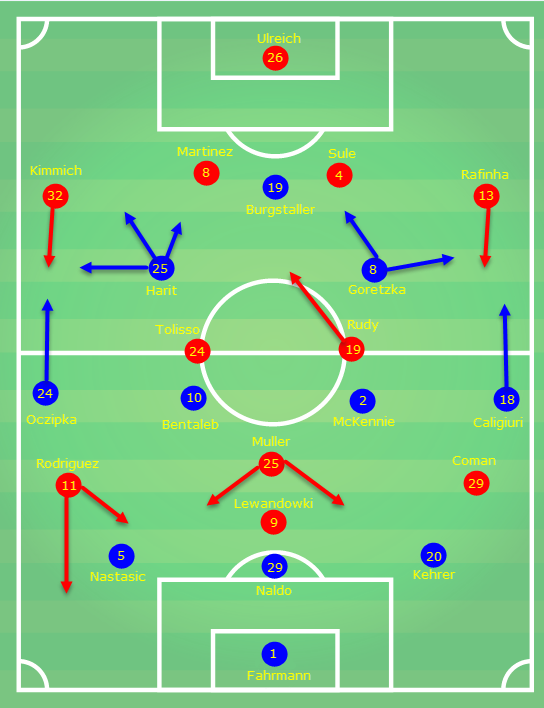 Schalke’s game-plan became apparent pretty early on – pack the midfield with plenty of bodies to restrict Bayern being able to play through the midfield. With both Kingsley Coman and Rodriguez on the flanks, they were hoping to frustrate Bayern into playing long-balls towards the wingers – who aren’t known for their aerial prowess and to Lewandowski up top. 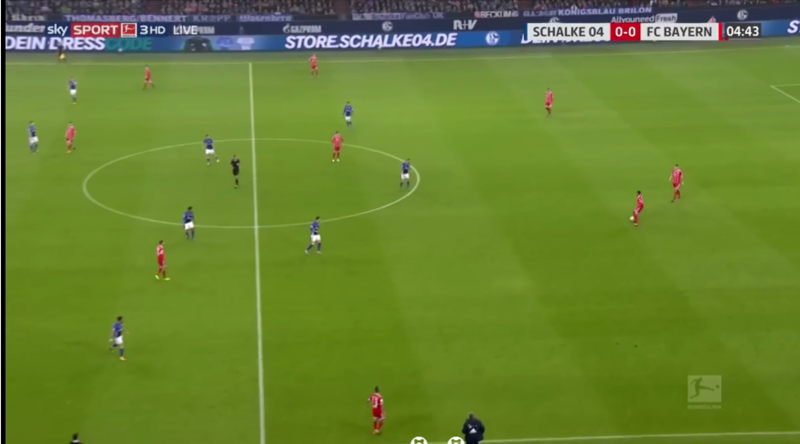 You can see in the picture above that Bayern are attempting to play out from the back, but Schalke are dropping deep. Corentin Tolisso is the player on the ball, and as he’s one of Bayern’s midfielders – dropping back so deep leaves Bayern severely outnumbered in midfield, somewhat interestingly though Schalke doesn’t seem to be screening Sebastian Rudy (pictured in the centre circle), and the same happens when Tolisso passes the ball on. This isn’t an obvious oversight from Schalke, and instead are likely creating a pressing trap – hoping to surround him with players and inviting him to receive the ball. When he receives the ball the surrounding players will rapidly close him down from all angles – potentially leading to a good counter-attacking chance. The same is done to Josh Kimmich (seen at the top of the picture above) and as soon as he receives the ball it leads to an impressive display of both pressing and defensive shape. Playing in the same setup as Schalke against a team like Bayern Munich and hoping to contain them for the whole game is always going to be a tough ask, and Schalke were the architects of their own destruction, with plenty of individual mistakes gifting chances to Bayern. The first happened within 10 minutes, as Naldo slipped gifting Bayern a golden chance with Tolisso just unable to make the dangerous cross across the face of the goal. Naldo was again at fault for the first goal of the match, by putting his hands up after sliding to block a Rodriguez cross, with the ball rebounding up and striking his arms. The penalty was eventually awarded and Lewandowski made no mistake from the spot as he netted his 6th goal in just 5 games. The second goal was again, due to Schalke’s own making. A Schalke throw-in in a relatively harmless part of the pitch was rushed which lead to them losing the ball. The impressive Schalke defensive shape from earlier vanished as several players were in pointless positions, which meant as soon as the mistake was made – a goal was inevitable. The picture above is of the throw-in. Muller circled in red wins the ball and instantly plays it across to Rodriguez who, in acres of space was always likely to score. I’ve labelled 2 defenders here: Thilo Kehrer is labelled number 1, and Matija Nastasic is labelled number 2. Both are partially at error for the goal, as Kehrer has come across to provide a safer option for the throw-in it means the rest of the defence have to shuffle across. But Nastasic has come across too much in my opinion (particularly as there’s no man near him) – particularly as Rodriguez is lurking wider. So Nastasic could have been further across in case of a quick turnover in possession, and I also think Kehrer has made an error in his positioning and should be closer to where Naldo is (next to Nastasic) – leaving the throw-in taker to instead throw the ball down the line where less damage could have been done and Schalke could’ve still had a chance to get something out of the game. The game was further put beyond doubt in the second half with a fantastically worked goal for Vidal to tap home. At the other end of the pitch Schalke were a bit lacklustre and rarely created anything of note, demonstrated by the shot maps below with all their shots (in orange) coming from either outside the box or from wide areas, whereas Bayern looked a lot more clinical with plenty of shot from central and dangerous areas. Overall the scoreline of 3-0 flatters Bayern a bit and doesn’t give Schalke enough credit for their defensive play – despite the mistakes made. Domenico Tedesco has certainly worked out how to get Schalke playing well, and the 3 wins with only 3 goals conceded in the 4 games beforehand are a testament to that.